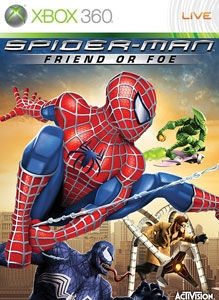 The Xbox 360 Games on Demand version of Spider-Man: Friend or Foe was confirmed delisted on January 1, 2014. “As the Spider-Man: Friend or Foe experience unravels, Spider-Man and his sidekicks unlock a variety of arenas and secret areas containing special tokens which allow players to revisit previously explored levels at any time as well as fortify their cache of collectables and power upgrades. Gamers can also replay levels as Spider-Man’s darker, more mysterious persona, Black-Suited Spider-Man, and experience a robust Versus mode, with multiple arenas, where players match up any two characters and battle it out to see who wins.